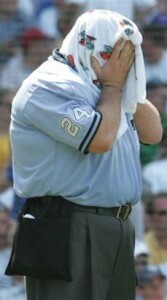 In this photo, check out Jerry Lane, a Major League Baseball umpire who isn’t exactly fit. You would think Major League Baseball would want their umpires to be good representatives of the game. Who are some famous baseball umpires?